In addition, we also handle all types of domestic abuse matters, including the obtaining of restraining orders. Our attorneys know that when our clients are faced with family law issues such as divorce and child custody, it is a very difficult time in their lives. The family is breaking up and emotions are running high. Our clients need and deserve caring, compassionate legal representation. That is exactly what we give them. While our law firm always seeks to resolve our clients’ issues in the least contentious way, we nevertheless are fully prepared to go to court and aggressively advocate on our clients’ behalf when the need arises. We take the time to get to know our clients, understand their values, concerns and goals, and fully answer their questions. In addition, each client works with one attorney from the beginning of his or her case to its successful resolution, but has the benefit of our entire team’s experience and insights. 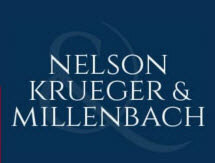 Nelson, Krueger & Millenbach, LLC, offers free initial consultations. We also accept Visa, Mastercard, American Express and Discover cards for our clients’ maximum convenience.